Hello, and welcome to The Dimensional Hunters, sequel to The Dimensional Summoners. Despite this, you don't need to have played any of the other games to play this one, but familiarising yourself with how they play is worth a try. 1- If a character from a franchise has already been picked, in this thread or in Renegades, I'll request that you pick another one. Simply put, it's a bit boring if we have a party of Pokemon or Avengers. 2- Please don't pick any super obscure characters. If I can't make a sufficiently varied movelist for the character, I'll request you pick another. The goal of the battle phase is to defeat all of the enemies, or complete another objective outlined in the update. In order to battle, post your action to the thread before the deadline. In battle you have 2 new techniques available. These are the Astral Surge and the Limit Break. Astral Surge- By your vitals, you can channel the power of the stars into a spell to cast on your opponents. This acts as a Basic move, so there is no cooldown on this. Depending on your HP and cooldowns, these attacks can have different effects. Limit Break- Take enough damage during battle, and your Limit Break gauge will increase higher and higher. Once it reaches a peak, you can use a limit break on this turn, a powerful move ranging from a strong elemental attack to an increase in EXP yield. Combo Attack- An attack in which several party members team up to deal a ruthless barrage of damage on an enemy. All that needs to be posted is that you'll be doing a combo attack. However, if you attempt it alone, you will fail. The strength of the attack depends on the amount of people participating. This move has no cooldown. Legendary Weapons- These are weapons bestowed upon the greatest Hunters. These have infinite uses, and usually unique effects in addition to these. Power of the Multiverse- With the hopes of the Multiverse on your back, you lead the way to a brighter future. You can tap into this powerful force, and enter a super mode where your Astral power is maximised to allow you to choose what element you wish to attack with. In addition to this, if your EXP is the same level as your Astral Surge counter, your move while in this mode will hit all targets. The cost of this great power is that it will damage you while you are in this mode. Additionally, you must spend a phase to enter this mode. You can attack and leave this mode in the same phase, however. Last edited by Garf on Sun Apr 05, 2015 6:58 pm, edited 139 times in total. Re: The Dimensional Hunters- Coming Soon! (25/25 LP) *LIMIT BREAK READY! Ability- Hot Blood- When your health drops below 5HP, your attack strength doubles! Super- Siegfried Unlocked- You can now change your Knightmare Frame to Siegfried! Super- Sutherland Sieg Unlocked- You can now change your Knightmare Frame to Sutherland Sieg! Ability- Mist of Fate- When on low health, your evasiveness is boosted! Ability- Phase Boots- Your move priority has been permanently increased by 1! Ability- Hunger- If an enemy is defeated by you in a battle, your attack, defence and evasiveness are boosted for the rest of this fight. This can be boosted further by KO'ing more enemies. This is separate to any other buffs. Last edited by Garf on Sat Apr 04, 2015 10:23 pm, edited 152 times in total. Yamcha- One of the strongest humans on earth, Yamcha uses a mix of his own self taught 'Wolf Fang Fist' and techniques taught by the Turtle school. Unfortunately, compared to his friends, he just can't keep, even being bodied by a Saibaman. HP 30, Attack 3. Weak to Fire and Light. No resists. Jack Krauser [Grandmaster- RENEGADE]- An ex-comrade of Leon and a master of many forms of combat, he uses his wide range of weaponry and Plaga induced powers. 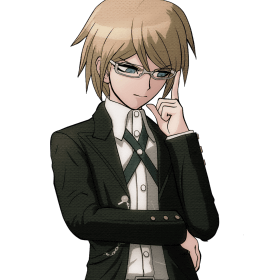 Recently, he was part of the Summoning team which managed to stop the Director before he could destroy the universe. He decided not to follow the plan of the Light Magician, and now is to be captured on sight. HP 50, Attack 16. Weak to Ice and Fire, Resists Physical. Magnus- Known as the strongest human, he wields a large sword. Not large enough to be considered a slab of metal, but it's big enough to be considered a club. Other than bashing down what's in his way, he doesn't have much else going in forms of offense. HP 55, Attack 6. Weak to Wind, Resists Dark. Gaol- Once a comrade of Magnus, this warrior was captured by the Underworld Army and made to command their forces. Luckily, Gaol was broken free of the mind control by Magnus and Pit, and now she fights alongside her former comrade with her powerful magic. HP 60, Attack 5. Weak to Fire, Resists Ice. Amaterasu- [Expert Summoner- RENEGADE]- The shinto goddess of the sun, this divine wolf traveled across Nippon to fight off the forces of evil. In addition to her summons, she wields an array of divine weapons and her Celestial Paintbrush, which can create bombs or even slow time. HP 37, Attack 13. Weak to Dark, Resists Light. Tycho- [Evoker- RENEGADE]- An author avatar, originating in Penny Arcade. Known for his keen writing and sharp tongue, he also carries a wide array of tools he's amassed amongst the years to wield. Just keep an eye out for his dark side... HP 40, Attack 11. Weak to Water, Resist Wind. Chaos Sailor Mars- A fiery Sailor Scout, recreated with Anomalies. Her fiery techniques leave no-one standing, with many hitting everything in the field. HP 70, Attack 10. Weak to Water, Resist Fire. Absorb Elec. Chaos Sailor Jupiter- Tall and tough, this is yet another Sailor Scout recreated with Anomalies. In battle, she uses Electric attacks with extreme prejudice. HP 85, Attack 9. Weak to Fire and Dark. Absorb Elec. Chaos Dayakkaiser- Piloted by Dayakka Littner, until he became the captain of the Dai-Gurren, this gunman's cannon deals ferocious damage. Now piloted by Kiyoh Bachika, it can team up with the King Kittan to become the King Kittan Deluxe! HP 120, Attack 9. Weak to Water and Dark. Resist Fire. Absorb Elec, Immune to Stun and Poison. Chaos King Kittan- The mecha of Kittan Bachika, eldest of the Black Siblings, it has a deadly headbutt! And when it teams up with his sisters mechs, the Kiyalunger and the Dayakkaiser, it becomes the King Kittan Deluxe with super powerful offences! HP 110, Attack 7/9. Weak to Water and Light. Resist Fire. Absorb Elec, Immune to Stun and Poison. Sludgy Knife- A knife steeped in a foul substance guaranteed to poison any who are scraped with it. Thermite Gloves- Boxing gloves lined with thermite. Deal tremendous fire damage to one enemy, but deal some to yourself too. Last edited by Garf on Sat Feb 21, 2015 10:26 pm, edited 14 times in total. At a training base for Hunters, a group of 8 graduated at the top of their class. Having seen their potential, The Light Magician (Now a spectre, after the events of The Dimensional Dungeons and The Dimentional Renegades) decides to test their power. Sending them out to hunt a few powerful summoners, they pass his test with flying colours, even capturing a summoner they were not told to find. After their induction as Hunters, they were sent to track the leaders of the largest contingent of Summoners (See: The Dimensional Summoners). Investigating the regions around where their adventure was drawing to a close, they chase down some Summoners they see, who lead them to Krauser, a Grandmaster of Summoning. Despite beating him, he escapes, but the Light Magician Spectre acknowledges the prowess of the party. Knowing that while their job isn't the nicest, but it's for the best of the multiverse, they forge onwards, being told of a group of summoners inside a lab. Tracking them down, they catch a glimpse of them, before they were intercepted by two more Dimensional Summoners, Gotenks and Agent Washington. This time, the summoners were captured, but both the scientist and the powerful group of 8 escaped. Re: The Dimensional Hunters- ROUND 2! Dio poses having dusted himself off. If he can come back stronger than ever after being a bodyless head for a while he can come back after this. "I drank deep from the font and am renewed." Also for the new people replacing Slorp and Pacifist if he's not a thing anymore, will new characters receive some sort of level buff to lv. 9 or something? In the name of loyalty, I am here! Oh, this is back. And so is the raccoon! JenovaPX wrote: Also for the new people replacing Slorp and Pacifist if he's not a thing anymore, will new characters receive some sort of level buff to lv. 9 or something? Slorp went inactive despite the PM I sent him on the old forum, so I'm currently sorting out a person to replace him. The replacement player should be being sorted out soon, so let's not dawdle. After the party had been discharged from the hospital, they made their way to the War Room. There, Scout, Lennon, Sherlock, Mickey, Teddie, Ness, Wallace, Yoshi, Weebl and the Genie were waiting for them, along with Oracle and the Light Magician Spectre. - Due to extensive jammer and detector systems, cannot use wormholes to enter near the base. Closest safe range is 1 mile out of outer perimeter. - The perimeter of the base is weak fencing. This can be easily cut with many weapons, but the least guarded sections will be only accessible to ground troops, as they are above steep cliffs. There are areas where vehicles would be able to approach, but these are well fortified. - The area is still coated in the residue of Anomalies from the battle against the Director. Our scanning tech will not allow us to detect sneak attacks. - The north part of the base has an area of extremely high Anomaly concentration. It is guaranteed death to attempt to enter. 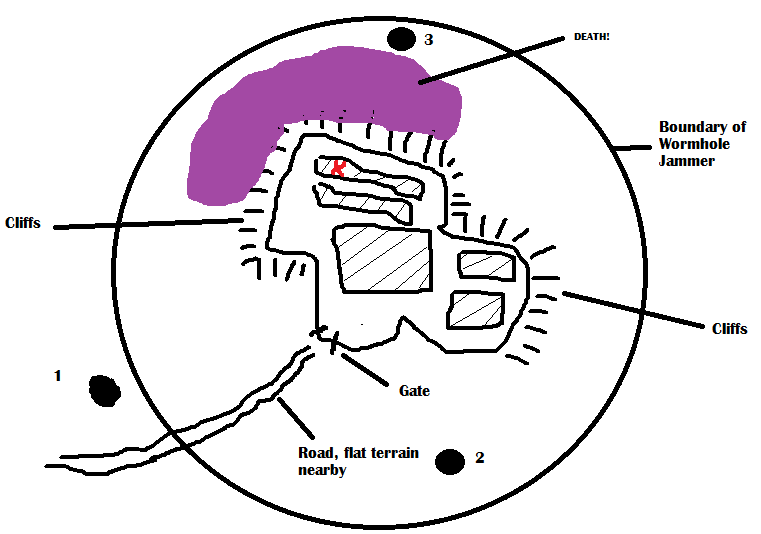 - Rudimentary map of the base. We do not have complete confirmation on what the interior of the base looks like, but the red X is where we believe the main command centre is. The Black circles indicate tunnel entrances. We do not know where they lead. - A series of balloons to evacuate captured troops via Fulton method. 'Of course, capturing the enemy is our main goal, not massacring them. I'd suggest using the large armature to weaken the structures, removing any defensive advantage they may have' said Oracle. You can now plan your mission. Whilst doing this, you should say what route your party should take. Jeremiah- 'Slash Harkens' are ready to use again! Abaddon- 'Mist Coil Heal' is ready to use again! Last edited by Garf on Tue Oct 28, 2014 8:01 pm, edited 1 time in total. My first thoughts involve some kind of infiltration mission disguised as a practical joke by putting Suu in water bombs. What sort of scale is the base? Well, the boundary is 2 miles diameter from what I can tell. Hoyle>	Can we not destroy the tunnel network and hope it's enough to cave in and gooseberry fool their base up from underground? Hoyle>	They're like "eton mess our base has collapsed"
That's the basics for now. Any non-IRCers want to throw ideas in? Mostly what to do with the 10 heroes and what tunnels to use and if this is dumb or not? I assume all tunnels will be large enough to accommodate everyone such as Hoyle's Knightmare and Masterhand and Gaz's bike and Abbadon's horsie etc? Because we could totally split up and fill our ranks with the heroes as Sherlock and Scout will likely help out in the tunnels and just send 9 into the tunnels and 9 up cliffs or whatever. Either way, I can totally sneak around pipes and eton mess to scout things out, I guess. The water won't be flowing too much in a ruined building that I'll get washed away. Yeah we all thought Hoyle's plan was dumb anyway so we're not doing that. There was more discussion of it after this but I can't remember much of it. Met/Jen can probably fill us in later. I just remember that we reached the conclusion that Dio can stop time which makes things surprisingly easy. Just realised I can make navigating the tunnels infinitely easier if I give Suu one of my evil implants I should be able to keep a track of her location while she navigates her way through the pipes of the facility and finds a possible exit. It might also be an idea to have Suu first find the power generators for the area and flood them to cause the most chaos with their defenses. If we're doing this under cover of darkness it'll also make infiltration and extraction infinitely easier. -I give Suu one of my evil implants to keep track of her whereabouts before she enters any nearby pipes whilst hidden under cover of darkness. -Suu will scout things out as best she can whilst she finds any signs of an exit from the tunnels. -A small group of soldiers led by Dio, Abaddon and Cartman will go through the tunnel 2 escorted by the heroes Sherlock and the Scout. -Sherlock will use his abilities of deduction and general awareness to help guide us through while the Scout uses his ability to Scout to help check the tunnels in front of us. We'll be heading in Suu's direction as Dio keeps track of her location. -Jeremiah will be waiting with most of the infantry keeping an eye on the base hidden waiting to lead an assault. -Masterhand and Mondo will take a small squad of people to the cliffs to the North East, slowly climbing them and helping troops scale it by hovering like a giant hand. -Once the tunnel group have found an exit we'll have Suu return to the pipes and try to find the base's power generators which she will then flood from a safe position. -Once the power cut happens the tunnel group will make their way towards the gates, knocking out any troops they encounter along the way as Abaddon keeps aids our stealthy skills with his shadows. Hook knocked out guards to the fultons. -Once at the gates Dio will freeze time and try to take out as many guards at the gate as he can in the darkness in that period, hooking them to fultons too. Once time resumes the group will take out any left and open the gates as quickly as possible. -At the time of the power cut Masterhand & Mondo and their group will cut through/scale the fence and make their way towards the command centre in the chaos. -As the lights go out we'll dispatch the Harrier to make a quick strike on the area with the command centre to throw it into chaos and thin out any defenses in that area, hopefully clearing it out and opening it up for Masterhand & Mondo's group. -Once the gates are open Jeremiah will lead an assault of the other troops in the ATVs and tanks whilst piloting his Knightmare Frame. -Any significant movements of troops will be their primary target but other than that this will primarily be intimidation to force a surrender. In the event that they keep fighting then we will retaliate. -Once the gates have been opened the other heroes will join up with the tunnel group who will head towards the command centre whilst clearing out any other troops in their way. -We'll do whatever needs to be done at the command centre. -If the area is still hot once this has been done we'll try to head towards the cleared area Masterhand and Mondo came from for Chinook extraction. I think that about covers everything really and gives us a good spread.